There are 6 bedrooms. Please see main text for details about each of the bedrooms. 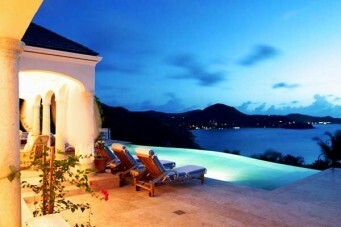 BON TEMPS Villa in St Barts is built in Palladian-style and has been recently renovated. This villa offers six- bedrooms and is located on the west side of Pointe Milou with broad sunset views of Chevreaux, Fourchue, Toc Vers, St Martin and Anguilla. Elegant open-air living is enjoyed from expansive outdoor rooms and terraces, all on one level, and overlooking the large 50 ft infinity edge pool melting into the ocean beyond. Sunsets are celebrated daily from a pair of curved stone banquettes appearing to float over the ocean. Prices list vary depending on the number of rooms used. A 10% service charge applies additional and this may vary depending on the season. Surrounded by lush tropical gardens, the BON TEMPS villa in St Barts is finshed in a décor of white, soft greens and blues with hand-painted tile lounge banquettes on the terrace, mosaic floors in the living area and limestone floors throughout the bedrooms and terraces. This villa boasts six bedrooms, all with equal amenities including high ceilings, stone-tiled bathrooms and views of the ocean. On the same level as the living room, there are four bedrooms. Two have private terraces and outdoor showers. Two more bedrooms are on a lower level and have private covered terraces. White & pastel green striped walls. Private terrace, garden and view. Beautiful screened bathroom w/inside & outside shower w/shell & wood décor. Neutral décor w/wrought iron 4-poster bed. Open on to the main terrace & view. Beautiful screened bathroom w/shell & wooden décor . Located off the living room, similar to bedroom #2. White & salmon striped walls. Private terrace, garden and view. Beautiful screened bathroom w/inside & outside shower w/shell & wood décor. Lower level w/private terrace & view. Slightly smaller than upper bedrooms, but w/same ambiance. Screened bathroom. Beds can not be pushed together. Same size as bedroom #5,on the other side of the villa. Platform beds that CAN be pushed together. Private terrace and view. Screened bathroom. DINING ROOM: There are several dining areas around the pool with magnificent view over Lorient Bay. FITNESS AREA: Located on the ower level near bedroom #5. Fitness room with air-conditioning, fully mirrored wall w/ a raffia trim on the sides. Opens to the terrace. GARDEN: Tropical garden with bougainvillea, palms and pineapple plants. KITCHEN: BBQ, Blender, Coffee Maker, Dishwasher, Icemaker, Microwave, Toaster, Fully-equipped gourmet kitchen with marble work tops. Marble breakfast bar w/stools. Opens to the view, pool & terrace w/stone fountain in the back. LIVING ROOM: Woven rattan sofas w/overstuffed white cotton cushions, columns & long white drapes, mosaic tiling. Reminiscent of a Roman theater. TERRACE: Large covered terrace that runs the length of the villa with dining and lounging areas. The perfect area for relaxation.